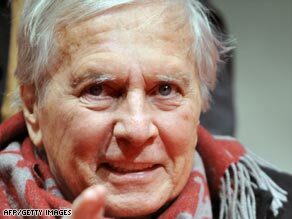 Oscar-winning composer, Maurice Jarre wrote score for "Lawrence of Arabia"
LONDON, England (CNN) -- The late Academy Award-winning composer Maurice Jarre enjoyed a glittering career composing the scores to many classic films. French composer Maurice Jarre wrote scores for films by Hollywood legends like John Huston, Alfred Hitchcock and David Lean. Last month, the 84 year-old who died Sunday gave one of his final interviews to CNN's The Screening Room, in conversation with fellow composer Alexandre Desplat. Jarre, who died of cancer, worked with many legendary directors, like Alfred Hitchcock and John Huston. But it is the French composer's work with British director David Lean -- the scores to "Lawrence of Arabia," "Dr Zhivago," and "A Passage to India," for which he won three Oscars -- for which he is best remembered. Twice Oscar-nominated French composer Alexandre Desplat, who has written the scores for Stephen Frears' 2006 drama "The Queen," and last year's "The Curious Case of Benjamin Button," regarded Jarre as an inspiration and an influence. "Maurice was an immense artist; an incredible symphonist; a magician of the melody and a benevolent human being," Desplat told CNN in tribute to Jarre who he describes as the greatest composer of the last 50 years. Alexandre Desplat: I don't know if you know, but the path that you traced for us French composers is phenomenal and indispensable. And, of course, love for cinema and theater is something that unites us, because I also wrote a lot for the theater like yourself. MJ: Hitchcock. This type of director has disappeared. They no longer exist. AD: One can sense with your work this passion for cinema, and for images -- your complete dedication to images. I think I also have this devotion, in fact, I don't think, I know, because it's devoured me since I was an adolescent. There are many composers of whom I know that are film composers by default, simply because it's a job; it's a good occupation. I don't sense in them that love for images, and that inspiration films has given us. AD: This dedication to the cinema is all-encompassing. When one is a composer for films, it's day and night. One needs to be in great physical condition! AD: I know that like me you must have worked 18 to 20 hours a day because there was no choice. Unless we are directing other people, having people work for us. In this case you'd probably have to do less. But as we're, I think, somewhat intelligent, and in love with details and in love with the timbre of the orchestration. MJ: That's why I was so disappointed that you lost the Oscar [Desplat was nominated for Best Score in 2006 for Stephen Frears' "The Queen."] The award is not that important, but it has sentimental value for you, because I respect your work. AD: I hope to one day achieve three Oscars like yourself Maurice. But you have to keep in mind that the rewards for the work are secondary. AD: What's essential is to have extremely talented directors who listen to you. That's the best reward, because your talent as a composer can express itself. You can search, you can invent something. With films where the directors aren't so great, it's much more difficult to write good music. MJ: You know, before I wrote the first electronic score for Peter Weir, for "Year of Living Dangerously," nobody wanted to hear about a purely electronic score, but Peter Weir used it in an artistic manner. That's what was so great. AD: That is, for me, an example because after having done 70 or 80 film scores, I realize it is perhaps time for me to be careful not to repeat myself, and to find a new voice. I think that the path you took in the 1980s ... I find it extremely courageous to abandon the orchestra for electronic music. For me, it's an incredible example. What was for you, Maurice, the most beautiful experience, or the Oscar which you loved most? MJ: Of course, it's the first [for "Lawrence of Arabia" in 1963]. It's a sentimental one, because David Lean and I became good friends. With the good directors it was always an interesting experience -- and a difficult one -- because we always had slightly different visions at the outset. But, it always arranged itself. I never really had a 'bust-up' with a good director. A good director will always find an intellectual understanding. And that's what was great - I had an opportunity with all these people. I don't think I can say that I ever worked with a bad director. There were never any real problems; there were discussions ... a bit of diplomacy here and there.